David Hirsch rode about 2,300 miles for Dads Honor Ride. A man from the Chicago area plans to bicycle all the way home from Boston to urge fathers to deeply engage with their children. David A. Hirsch, 55, believes that many of society’s ills, from high dropout rates to drug abuse to crime, are connected to children growing up without fathers or other strong male role models. 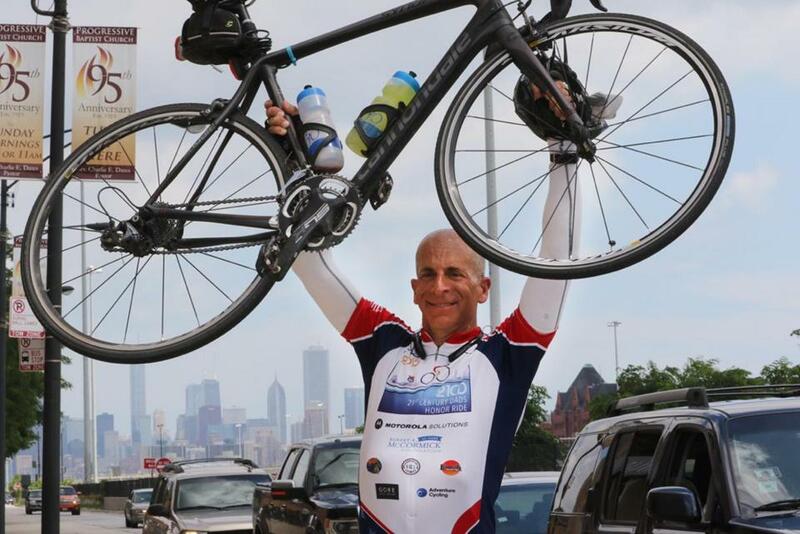 His 1,500-mile ride will begin on Memorial Day in Copley Square with Hirsch and a dozen other riders and — if all goes according to plan — end in Chicago on Father’s Day. Hirsch was raised by a single mother and professes great respect for mothers, but he believes children must have male role models. Absent fathers are not restricted to inner-city or minority families, as is sometimes depicted, Hirsch said. A father of five who has been married for 33 years to his high school sweetheart, Hirsch has been advocating for better relationships between fathers and children for 19 years. A financial adviser by trade, he is the founder of two nonprofit organizations, the Illinois Fatherhood Initiative and the 21st Century Dads Foundation, and of the company Team Dad LLC, which sells resources for fathers and gifts that honor great dads. Earlier this month, he published a book titled “21st Century Dads: A Father’s Journey to Break the Cycle of Father Absence,” which explores his experiences as a father, activist, and as a bicyclist in the first Dads Honor Ride. Last spring, Hirsch rode about 2,300 miles from Santa Monica, Calif., to Chicago, enduring heat, rain, and saddle sores as he biked for 21 days straight, sometimes for more than 140 miles in a day. He raised more than $70,000 last year, but Hirsch said he will be disappointed if this year’s ride does not garner at least $150,000 for the 21st Century Dads Foundation, which supports other fatherhood-focused organizations. Hubie Jones, a longtime Boston activist who founded Massachusetts Advocates for Children and serves as a senior adviser at City Year, has known Hirsch for more than two decades. “He has played a major role in awakening folks . . . to the fact that there are 24 million absent fathers in the lives of children, particularly urban children, in this country,” Jones said.